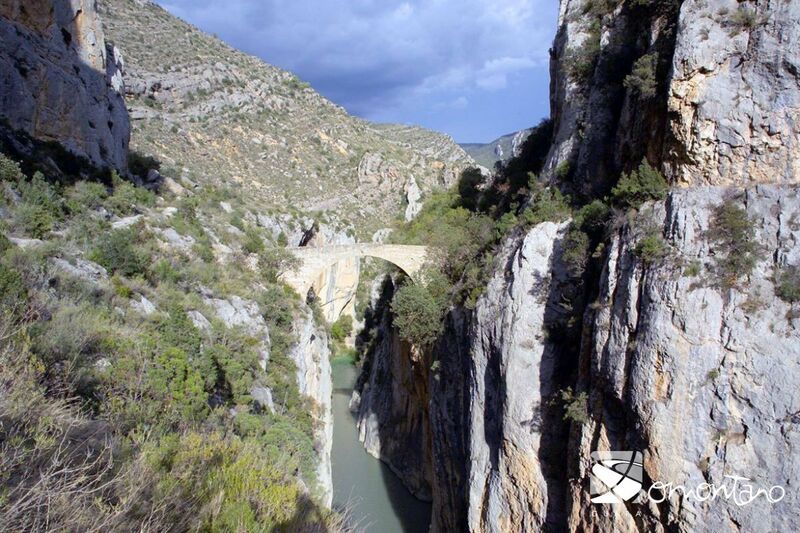 With its many rivers and a population scattered amongst small villages, Somontano has traditionally been covered by a multitude of paths, many of which had to cross gorges such as the one at Olvena. 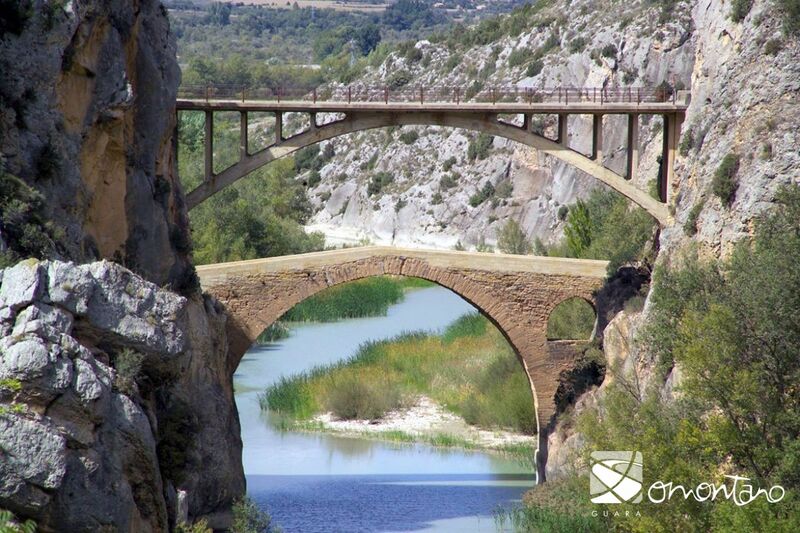 During the medieval era, the construction of a bridge was a luxury due to the high cost involved. Their construction was only considered once other more important necessities had been taken care of, such as churches or defences, and only in places of high water flow or great drops to reach the water. Only kings, the wealthy and the powerful could assume the costs of construction. As a result they were often financed by donations, which were solicited from the large cities and villages of the kingdom in exchange for indulgences, and by money from bequests, although these brought relatively trivial amounts. The scale of the constructions and the fact that they lasted beyond generations gave them a magical and supernatural character. Because of this, and also because of the technical expertise that was required to build them, many legends arose placing the devil as their architect, as is the case here.It is said that a beautiful young girl from Olvena, fed up with having to wade through the river as were the rest of her neighbours, offered her soul to the Devil in return for a bridge, on the condition that he was able to construct it in just one night. Satan accepted the deal and they agreed that if the bridge was finished before the cockerel’s crow the following morning, the young girl would hand over her soul. Despite the fact that the Devil’s cunning helped him to build the bridge in just one night, the girl placed a candle in front of the cockerel a little before dawn. Thinking that it was already day, he started to crow. The Devil didn’t quite finish the bridge (he left out the last stone) and so lost his bet and had to return to the fires of hell without achieving his mission. This legend is told in many other places in Aragon with almost exactly the same plot but with different names and the scenery. However this dramatic spot is one of the easiest places to envisage the Devil having a hand in the construction of the bridge. Medieval bridges are narrow because at that time the roads were no more than footpaths. Wider bridges were only built once the use of the cart became more widespread. They usually sit on rock as it provided good support for the foundations. 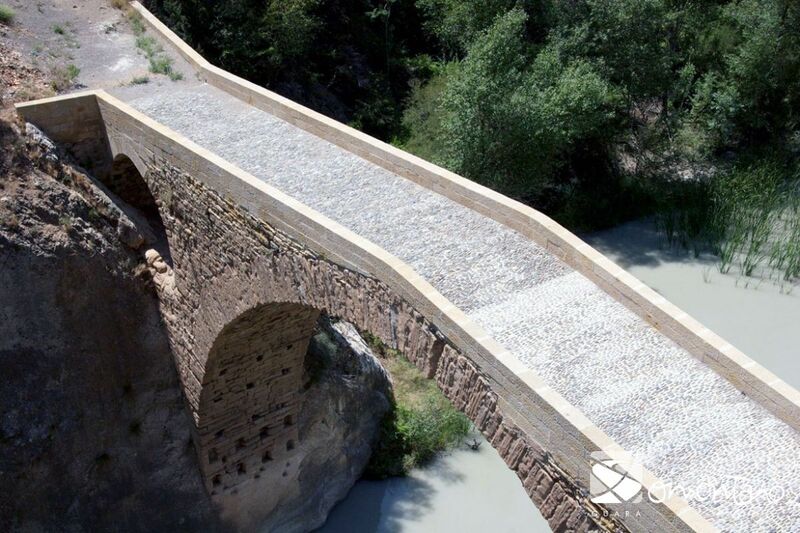 This meant that their construction was more complex and required more effort than modern day bridges, which are often built on the river bed. The stronger the construction and finish, the longer the bridge would withstand the sudden rises of water level in the rivers of Somontano. 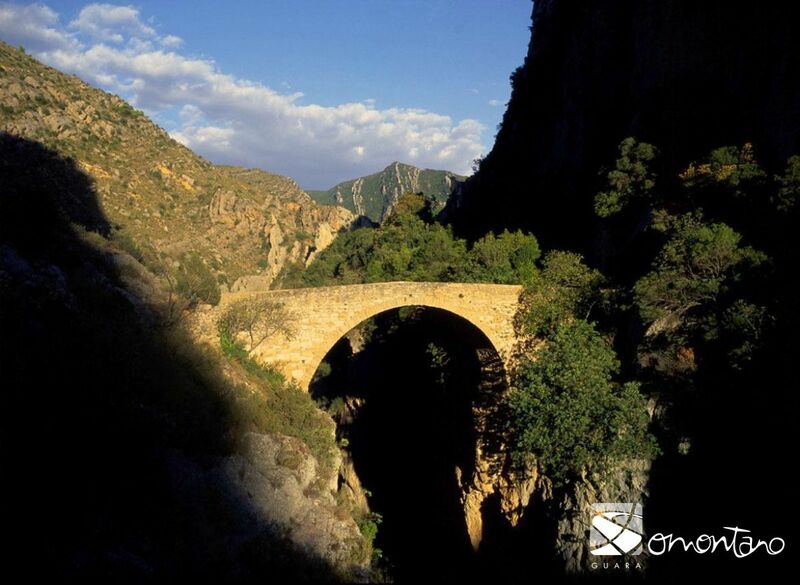 Medieval bridges (such as the bridges in Olvena) usually have a single arch but appear high and light giving them an attractive and slender silhouette. The Devil’s Bridge has a large central arch supported by rock and seats have been carved out on both banks. The smaller arches to the side served as spillways. 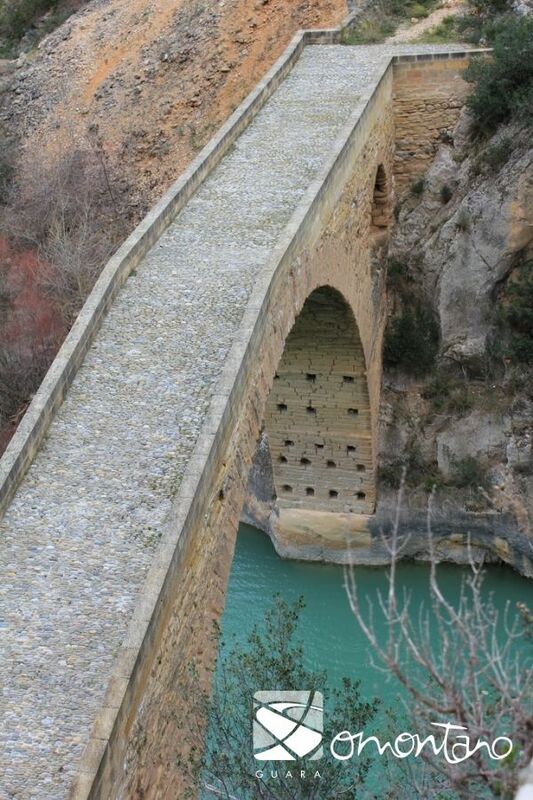 The Sierra Bridge is located a little further upstream; after leaving the car in a small lay-by at the end of large tunnel, walk for around 100 metres to reach the site of this magnificent construction. It is more impressive due to its great height.